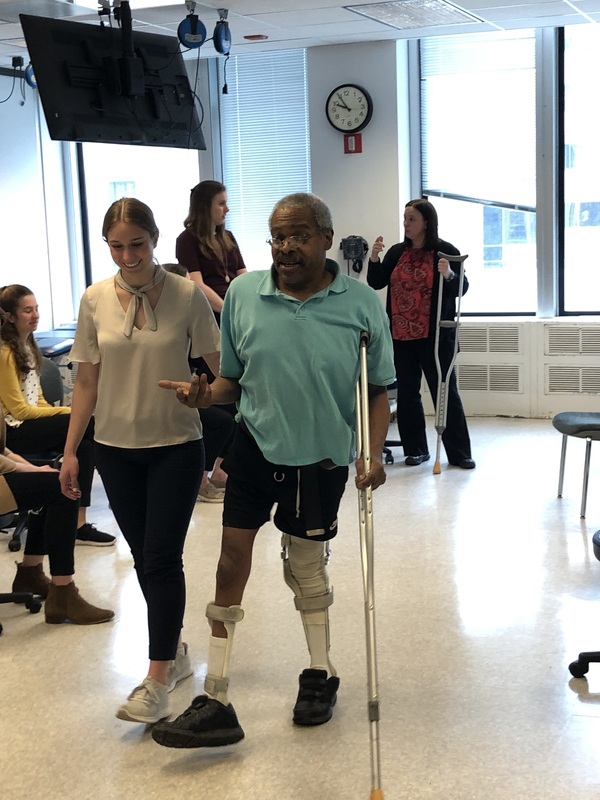 A group of nearly 100 second-year Doctor of Physical Therapy students recently participated in an annual interprofessional orthotics learning experience with members of the Northwestern University Prosthetics-Orthotics Center (NUPOC) and Department of Physical Therapy and Human Movement Sciences faculty. During the session, students also worked with community volunteers with neuromuscular conditions including stroke, cerebral palsy, and post-polio syndrome ranging in age from 7 to 70 years of age, all of whom use orthoses. Students conducted an initial patient intake and evaluated the volunteers’ mobility to develop a comprehensive lower limb orthotic treatment plan. This experience had benefits for the volunteers, as well. One participant who has volunteered for over 20 years in various Feinberg departments noted these community-engaged learning experience are important because they provide new knowledge about his condition and give community members a sense of fulfillment. “I’ve always liked to teach; one of my minors in college was education, so I’m an educational model, that’s the way I feel about it,” the volunteer said.